With close to 71,500 Regular Force members in the Canadian Armed Forces, 30,000 Reserve Force members, 60,600 military families and over 649,600 Veterans, we have a significant population with unique risks, exposures and experiences that demands new standards of protection, prevention and care for the ill and injured. Each year, CIMVHR works to engage existing academic research resources, facilitate new research, increase research capacity and foster knowledge translation. This work is showcased each year, when thought leaders from the government, academia, industry and philanthropic sectors gather at our Forum to present new research, exchange ideas, share insight, learn and collaborate. CIMVHR: Serving those who serve us. The 9th Annual Military and Veteran Health Research Forum was held in Regina from October 15-17, 2018. Our co-host, the University of Regina, is home to the Canadian Institute for Public Safety Research and Treatment. Given this collaboration, CIMVHR Forum 2018 featured over 200 research presentations on health research for military, Veterans, public safety personnel and their families. Our 2018 conference kicked off with a warm welcome from Regina-Wascana MP and Minister of Public Safety and Emergency Preparedness The Honourable Ralph Goodale as well as an address from Mr. Stephane Lauzon, Parliamentary Secretary to the Minister of Veterans Affairs and Associate Minister of National Defence. The very first scientific presentation was presented as a Panel on Advanced Analytics moderated by Ms. Nora Spinks and featuring panelists Dr. Lisa Patton, Dr. Alex Singer and Dr. Cathy Boscarino. Over the course of the 3 days, we also heard from remarkable keynote and featured speakers, in order of appearance: RAdm H.C. Edmundson, Dr. Benjamin Dunkley, Dr. James MacKillop and Dr. Andrew Cap. Our annual Forum is where delegates from all around the world gather to hear top research in the field of military, Veteran and family health. Each year, CIMVHR brings together academia, government, industry, philanthropy, clinicians, and decision-makers to improve the lives of our serving members and their families. Forum also offers workshops designed to engage and develop emerging research fields. CIMVHR Forum is the premier event bringing the latest military, Veteran and family health research to those who develop practices, policies and programs. CIMVHR Forum 2018 celebrated emerging scholars in the field of military, Veteran and family heath at the 2nd Annual Student and Post-Doctoral Engagement Committee Networking Event sponsored by Wounded Warriors Canada. Two students in particular were highlighted at Forum: Stephanie Houle-Johnson, PhD Cand., University of Ottawa and Mr. Massimo Cau, MA Cand., University of British Columbia. Ms. Houle-Johnson was awarded the Wounded Warriors Doctoral Scholarship in Military and Veteran Health Research and Mr. Cau was awarded the Royal Canadian Legion Master’s Scholarship in Veteran Health Research. CIMVHR Forum 2018 welcomed a new Board Chair, Dr. Elizabeth Taylor, University of Alberta. The institute also appointed its 8th fellow, Dr. Christian Kastrup, University of British Columbia. Dr. Kastrup, as a fellow, joins a remarkable group of researchers who demonstrate exceptional research advancements within the field of military, Veteran and family health. To recognize the outstanding research presented over the 3 days, five awards were presented to researchers and their teams for their outstanding presentations at CIMVHR Forum 2018. This year, Robert Hawes, PhD Cand., Canadian Forces Health Services Group (CF H Svcs Gp), received the prestigious Banting Award sponsored by True Patriot Love; Ryan Van Slyke, Syracuse University, received the Via Rail Student Research Award; Lieutenant Colonel Suzanne Bailey, CF H Svcs GP, received the Homewood Mental Health Treatment Award; Dr. Deborah Norris, Mount St. Vincent University, received the Colonel Russell Mann, Military Family Health Research Award sponsored by The Vanier Institute of the Family; and Alina Protopopescu, PhD Cand.,, McMaster University, received the Journal of Military and Veteran and Family Health (JMVFH) Editors' Choice Award. CIMVHR Forum 2019 will be in Ottawa Gatineau, October 21 to 23. See you next year in the nation’s Capital! Dr. R. Nicholas Carleton, University of Regina, and Drs. Stéphanie Bélanger, David Pedlar and Heidi Cramm, CIMVHR. The Eighth Annual Military and Veteran Health Research Forum, the official research partner of the Invictus Games Toronto 2017, was held in Toronto from September 25 – 27, 2017. 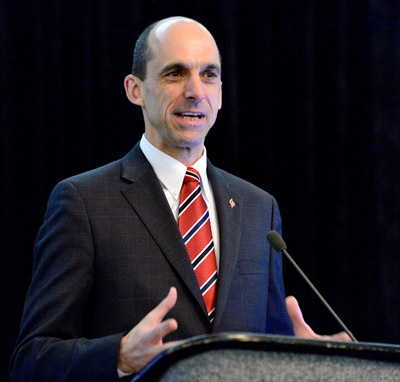 This marked CIMVHR’s largest conference to date, this is thanks to the 43 Canadian universities, 8 global affiliates, countless government researchers as well as many industry and philanthropic partners that make up the CIMVHR network. Over the course of the event, 198 research presentations were delivered by 173 different researchers to over 600 delegates. Research presentation topics included: advances in primary and trauma care; gender differences in health, mental health and rehabilitation; novel health technologies; occupational health; physical health and rehabilitation; social health and wellbeing; and transition from military to civilian life. Forum 2017 included pre- and post- Forum Research Theme Working Groups. The themes for these working groups included: Cannabis for medical use: exploring risks and possibilities; towards a better understanding of how and when musculoskeletal injuries occur – aiming for more effective preventative strategies; culture and diversity in relation to the mental and physical health of military personnel; transition and the family; and contemporary research with public safety personnel. CIMVHR Forum 2017 was held in partnership with the Invictus Games Toronto 2017. The Invictus Games Toronto 2017 showcased the power of human spirit in using adaptive sport in the recovery of ill or wounded service members and re-engagement with their families and communities. 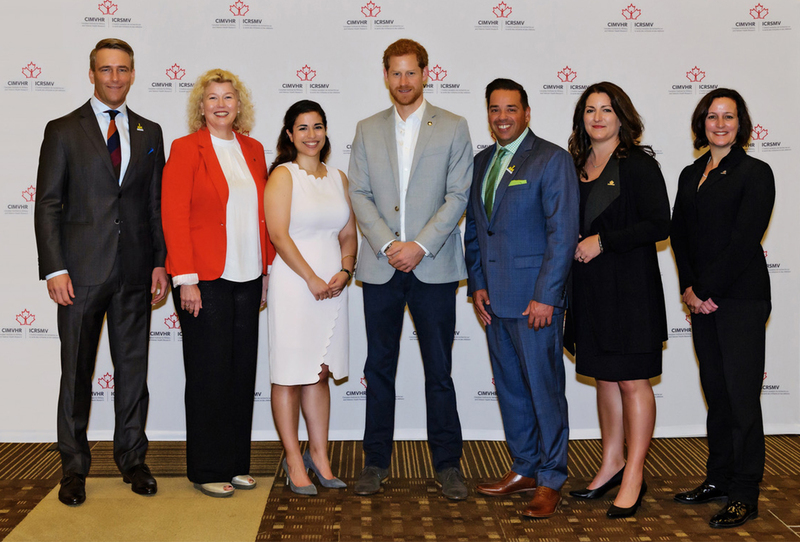 As the patron of the Invictus Games, His Royal Highness Prince Harry also came to Forum and spoke about his passion to change the lives of service members and their families through sport, and of the importance of research. A recording of his speech is available here. 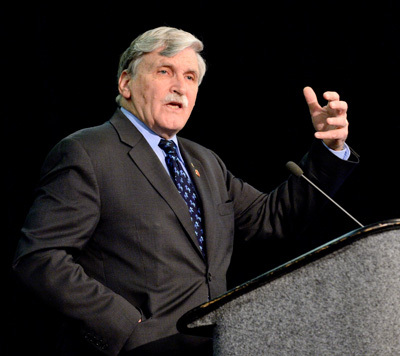 John W. Boerstler – Executive Director, NextOp. Additional highlights of Forum 2017 included a presentation by Dr. Celina Shirazipour, Dalhousie University, on her research about the impact of adaptive sport on recovery for those wounded both physically and psychologically through military service. Dr. Christian Kastrup, 2016 Banting Award Winner, presented his innovative research on treating severe hemorrhage with self-propelling particles to the delegation at Forum. Six new CIMVHR Fellows were named during Forum 2017: Dr. Deborah Norris, Mount Saint Vincent University; Dr. Don Richardson, Western University; Dr. Jacqueline Hebert, University of Alberta; Dr. Jitender Sareen, University of Manitoba; Dr. Bradford McFadyen, Laval University; and Dr. Tim Black, University of Victoria. BGen Andrew Downes, Surgeon General presented the 2017 Banting Award for Military Health Research to Dr. Benjamin Dunkley, The Hospital for Sick Kids & University of Toronto, for his research Perception of Emotional Faces Induces Fear Circuit Hyper Connectivity in Soldiers with PTSD. Thank you to all Forum delegates for your engaged participation, and to the Forum 2017 sponsors and volunteers for your commitment and generosity. With your continued support, CIMVHR is able to fulfill its mission to enhance the lives of Canadian military personnel, Veterans and their families by harnessing the national capacity for research. The Seventh Annual Military and Veteran Health Research Forum was held in Vancouver at the Westin Bayshore from 21 to 23 November 2016. Over the course of the three-day event, 175 research papers and posters were presented to a delegation of 600 people from the military, government, industry and academia. Further, 6 Research Theme Working Groups were organized on emerging research fields with the participation of over 250 delegates. Forum delegates also had the opportunity to hear from many distinguished keynote and featured speakers, including The Honourable Judith Guichon, Lieutenant Governor of British Columbia; The Honourable Kent Hehr, Minister for Veterans Affairs and Associate Minister of National Defence; Lieutenant-General C. Whitecross, Chief of Military Personnel; Colonel Scott A. McLeod, Deputy Surgeon General; Lieutenant General the Honourable Roméo A. Dallaire (Retired); Charles W Hoge, Colonel (retired), Author “Once a Warrior Always a Warrior”; Group Captain Rich Withnall, DACOS Health / Deputy Head RAF Medical Services and Defence Professor of General Practice & Primary Care; William P. Nash, MD, Director of Psychological Health, U.S. Marine Corps; and Dr. Deniz Fikretoglu, DRDC. As gala dinner keynote speakers, Forum 2016 hosted Captain (Retired) Trevor Greene, Journalist and the best-selling author of six books; and Dr. Ryan D’Arcy, BC Leadership Chair in Medical Technologies and Professor of Applied Sciences at Simon Fraser University. 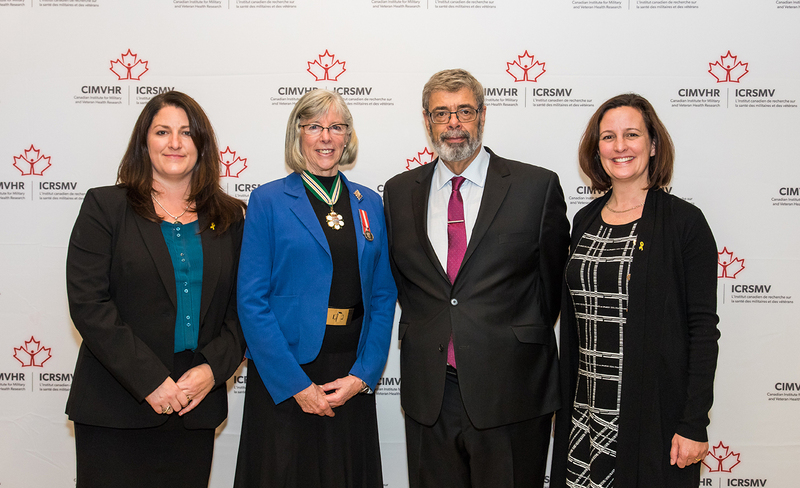 Some of the Forum highlights include the recognition of exceptional members of the CIMVHR community for their contributions to the enhancement of research capacity on military, Veteran and family health across Canada. During the opening plenary, hosted by the interim co-scientific directors Drs. 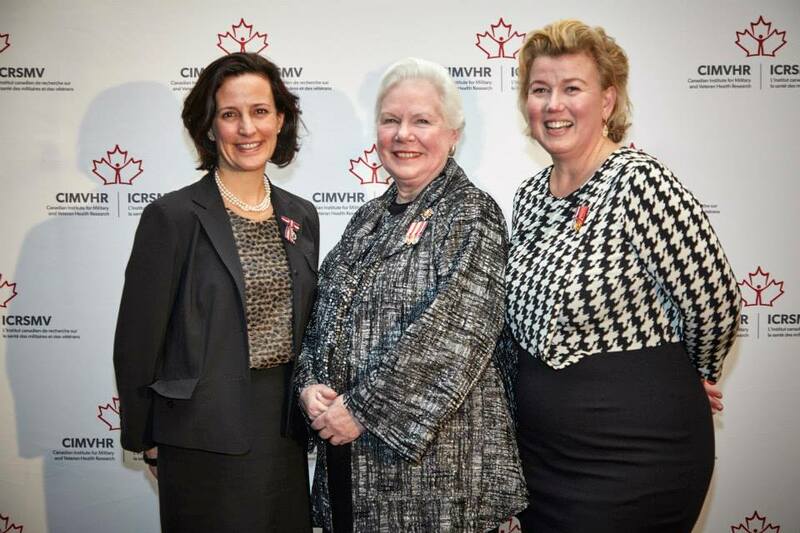 Stephanie Belanger and Heidi Cramm, Dr. Alice Aiken, Dean, Faculty of Health Professions, Dalhousie University and CIMVHR co-founder, was presented with the inaugural Certificate of Fellowship for her visionary leadership to CIMVHR and continued ambassadorship for the Institute. Furthermore, Lieutenant-Colonel Rob Poisson, Canadian Forces Health Services Group, was presented with a Certificate of Appreciation for his visionary guidance and meritorious dedication to CIMVHR. Annually at Forum, two prestigious scholarships are awarded to help support the next generations of researchers. This year, Ms. Linna Tam-Seto, Queen’s University was awarded the Wounded Warriors Doctoral Scholarship in Military and Veteran Health Research for her research on Enhancing health care providers' capacity to work effectively with Canadian military and Veteran families: A cultural competency model. As well, The Royal Canadian Legion Masters Scholarship in Veteran Health Research was awarded to Mr. Jeremiah Buhler, University of Manitoba, for his research on Efficacy of Online Chronic Pain for Military, RCMP, and Veterans: A Randomized Control Trial. In addition to the annual Major Sir Frederick Banting Award sponsored by the True Patriot Love Foundation, a prestigious recognition from the Surgeon General for the best research presented on military health, four other awards were presented at Forum 2016: the Via Rail Student Research Award; the Homewood Mental Health Treatment Award; the Colonel Russell Mann, Military Family Health Research Award sponsored by The Vanier Institute of the Family; and the Journal of Military, Veteran and Family Health (JMVFH) Editors’ Choice Award. Dr. Christian Kastrup, University of British Columbia, received The Major Sir Frederick Banting Award; Alyson Mahar, PhD, Queen’s University/King’s College London, received the JMVFH Editors' Choice Award; Ms. Rachael Gribble, King’s College London, received the Via Rail Student Research Award; Dr. Allison Feduccia, Multidisciplinary Association for Psychedelic Studies, received the Homewood Mental Health Treatment Award; and Dr. Heidi Cramm, Queen’s University, received the Colonel Russell Mann, Military Family Health Research Award. Thank you to all Forum delegates, sponsors and volunteers for their dedication and commitment and for supporting CIMVHR to fulfill its mission, harness the national capacity of research to improve the health of Canada’s military personnel and their families: past, present and future. 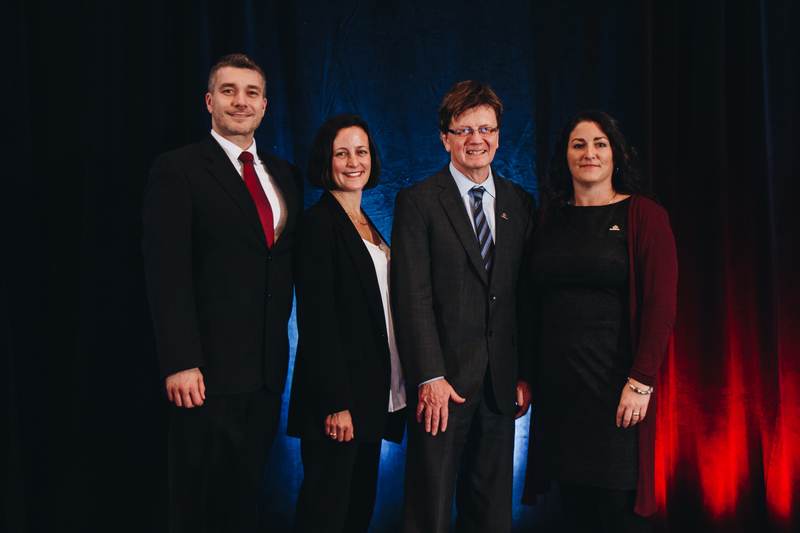 The Canadian Institute for Military and Veteran Health Research Forum 2015 was held at the Hilton Quebec in Quebec City from Nov. 23-25 featuring many remarkable keynote speakers: Hon. J. Michel Doyon, Lieutenant-Governor of Quebec; Gen (Retd) Walt Natynczyk, Deputy Minister of Veterans Affairs Canada; LGen Guy R. Thibault, Vice Chief of Defence Staff; BGen H.C. MacKay, Surgeon General/Commander CFHSG; Dr. Nicola Fear, Kings College London; Dr. Rory Cooper; University of Pittsburgh; and Dr. Stephen L. Fisher, University of Waterloo. Over the three-day event, there were 180 research presentations presented to a delegation of 600 people from the military, government, industry and academia. During the opening plenary, Drs. Aiken and Bélanger were presented with the United States’ Four Chaplains’ Legion of Honor Bronze Medallion by Dr. Cooper; an award that recognizes exemplary individuals who have gone above and beyond in service to their community and nation. Two prestigious scholarships are awarded at Forum every year to help fund the next generation of researchers. This year, The Royal Canadian Legion Masters Scholarship in Veteran Health Research was presented to Ms. Ashleigh Forsyth, Queen’s University, and the Wounded Warriors Doctoral Scholarship in Military and Veteran Health Research was presented to Ms. Helena Hawryluk, University of Calgary. The 2015 recipient of the Major Sir Frederick Banting award, sponsored by the True Patriot Love Foundation was Dr. Deniz Fikretoglu, DRDC. Four additional awards were presented this year: the Student Research Award, sponsored by Via Rail Canada, was presented to Ms. Linna Tam-Seto, Queen’s University; the Mental Health Treatment Award, sponsored by Homewood Health Centre, was presented to Dr. Craig Bryan, University of Utah; the Military Family Health Research Award, sponsored by the Vanier Institute of the Family, was presented to Dr. Alla Skomorovsky, DND; and the Editors’ Choice Award, sponsored by the Journal of Military, Veteran and Family Health, was presented to Ms. Andrea Stelnicki and Dr. Kelly Schwartz, University of Calgary. To all Forum 2015 delegates, thank you for serving those who served us. Forum 2014 was held in Toronto, ON and was extremely successful. During the Scientific Poster opening reception, Forum attendees had the honour of listening to an inspirational speech from CBC’s Rex Murphy, host of Cross Country Check Up. Rex spoke about the importance of serving those who serve us through evidence-informed practices, policies and programs. Staff, who discussed how removing stigma around mental health is critical to developing resilience. Other Forum keynotes included, in chronological order of presentation, Françoise Mathieu, Director of Compassion Fatigue Solutions Inc.; Dr. Mark Zamorski, Forum 2013 Banting Award Winner; Dr. Terence M. Keane, from the National Center for PTSD; and The Honourable Elizabeth Dowdeswell, OC, OOnt Lieutenant Governor of Ontario. Each year at Forum, attendees have the privilege of finding out the winners of two very prestigious scholarships offered through CIMVHR. This year, Wounded Warriors Canada announced that Celina Shirazipour, from Queen’s University, was the winner of the Wounded Warriors Doctoral Scholarship in Military and Veteran Health Research, while The Royal Canadian Legion announced former Reservist Brigitte Phinney, Carleton University, as the winner of the Royal Canadian Legion Masters Scholarship in Veteran Health Research. Good luck to both recipients, we look forward to seeing your research at future Forums. The Forum 2014 delegation had the opportunity to see over 50 poster presentations and listen to over 115 podium presentations that touched on six distinctive themes relating to mental health and rehabilitation; physical health and rehabilitation; social health and wellbeing; occupational health; novel health technologies; and, transitioning from military to civilian life. After three consecutive 'sold out' conferences in Kingston, Ontario, CIMVHR and University of Alberta co-hosted the 4th annual Forum in Edmonton Alberta. Our goal was to create a Forum for knowledge translation, networking and collaboration that would ultimately improve the health and well-being of our Canadian Military personnel, Veterans and their families – and thanks to the 125 researchers and 430 delegates from military, academia and industry – we believe that we achieved our goal! A few highlights from Forum 2013 include: The Royal Canadian Legion announcing funding for a Masters Scholarship in Military and Veteran Health Research, Wounded Warriors announcing that Dr. Duncan Shields was awarded its Doctoral Scholarship funding, the release of "Beyond the Line" (McGill-Queen's University Press), CIMVHR's third book, and an impassioned keynote address by The Honourable Donald Ethell, Lieutenant Governor of Alberta. To our delegates, presenters and sponsors, please accept our heartfelt thanks for your participation in and commitment to the Forum 2013. 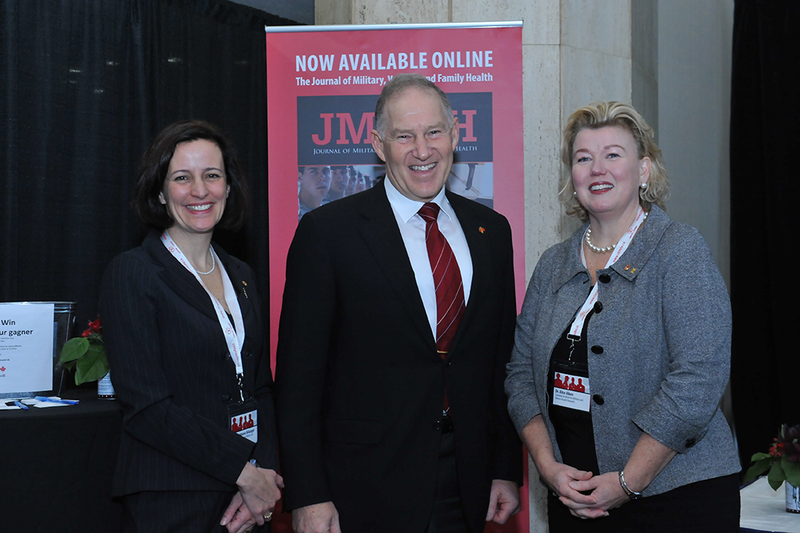 In November 2012 the Canadian Institute for Military and Veteran Health Research (CIMVHR) hosted its third annual Forum in Kingston, Ontario. The event hosted over 450 participants including international delegates, military personnel, keynote speakers, veterans, industry stakeholders and over 25 universities from across the country. 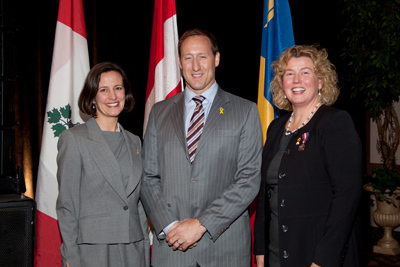 The event began with a poster session where the Minister of National Defence, The Honourable Peter MacKay, addressed the attendees with an encouraging message that began with his recognition for all of the hard work and dedication that the researchers of CIMVHR have contributed to the well-being of military personnel, Veterans and their families. Forum 2012 highlights included: Museum of Health Care 1812 Display, the announcement of CIMVHR’s first official Board of Directors, and excellent networking opportunities. The highly interactive Forum featured 14 keynote speakers and top quality research. As well, CIMVHR took the opportunity to celebrate the launch of their second collective, A New Coalition for a Challenging Battlefield; Military and Veteran Health Research, highlighting the top research presented at Forum 2011 and published by the Canadian Defence Academy Press. CIMVHR was pleased to announce that the 4th Annual Forum was going to be held in Edmonton, Alberta November 25-27, 2013. November 14th-16th 2011, the Canadian Institute for Military and Veteran Health Research (CIMVHR) hosted the second annual Forum in Kingston, Ontario. The Forum hosted 400 researchers, national and international representatives, clinicians, military and civilian personnel, prominent keynote speakers, veterans and major stakeholders. Highlights of the Forum included an interactive outdoor session by 1 Canadian Field Hospital, a $50 000.00 donation to CIMVHR from the Henderson Foundation, and the Gala dinner. The Forum featured 12 keynote speakers, 31 scientific posters were exhibited and 110 quality research papers were presented, focusing on significant aspects of mental health, operational and environmental health protection, rehabilitation, physical and mental, combat casualty care, transition from military to civilian life, and Health Care Policies and Programs. CIMVHR is extremely proud to have hosted Forum 2011, but could not have done so without the committed support of the its Sponsors, as well as from the Canadian Forces Health Services Group, Veterans Affairs Canada and Defence Research and Development Canada. In November 2010, Queen's and RMCC hosted the inaugural Forum. The Forum was designed as a first step in the process of creating a national institute for Military and Veteran Health Research. By all accounts, the gathering was a great success. This first Military and Veteran Health Research Forum sold out and hosted a delegation of 250 researchers, clinicians and others interested in military and Veteran health research. Delegates came from across Canada and abroad to share their research and meet colleagues with an interest in this area. The program was comprised of over 100 oral and poster presentations representing a wide range of research. At the close of this first Forum, a select group of academic, military, and government advisors held the first official meeting of the Canadian Institute for Military and Veteran Health Research (CIMVHR). The MVHR Forum is thankful for the ongoing and committed support of its Sponsors, as well as from the Canadian Forces Health Services Group, Veterans Affair's Canada and Defence Research and Development Canada.